At Endless Oceans Gozo we know that there is no substitute for a well trained buddy team working, and enjoying their dives, together. The reality is that being trained as a self-sufficient diver is often an advantage; be it on holiday in a group of unknown buddies, or a photographer and their buddy, we often find ourselves "Solo" diving with "Buddies". To help with these situations we offer the SSI Independent Diver Course which teaches how to become a safe, self-reliant and independent diver. 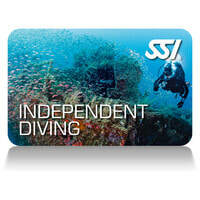 In the end you will have the skills needed for true Solo diving if that is the goal.